page of backpacks and hiking staffs. $19.95 - Parts Kit for 24" wide LuxuryLite and Thermarest Cots. Includes four Cot Feet, two female bow tubes and two male bow tubes. Colors may vary. Made in USA. Free USA Shipping. $19.95 - Parts Kit for 26" wide LuxuryLite and Thermarest Cots. Includes four Cot Feet, two female bow tubes and two male bow tubes. Colors may vary. Made in USA. Free USA Shipping. $19.95 - Parts Kit for 30" wide LuxuryLite and Thermarest Cots. Includes four Cot Feet, two female bow tubes and two male bow tubes. Colors may vary. Made in USA. Free USA Shipping. U.S.A. - $45.95 -- Mesh Sheet for 24" Wide Cots. - Perfect for hot summer nights. Tougher than the original fabric; very hard to tear. Breathes for cool sleeping in hot weather, or just laying around at the beach. Color is white. Water drains through... great for under a bivy. Works with the original side poles and tension bow tubes. Weighs 14oz. 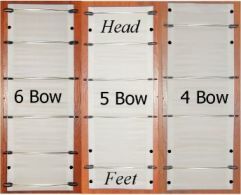 A) 4 BOW COT - You can use only 4 bows when you weigh 175lbs or less. They can be single or twist bows. 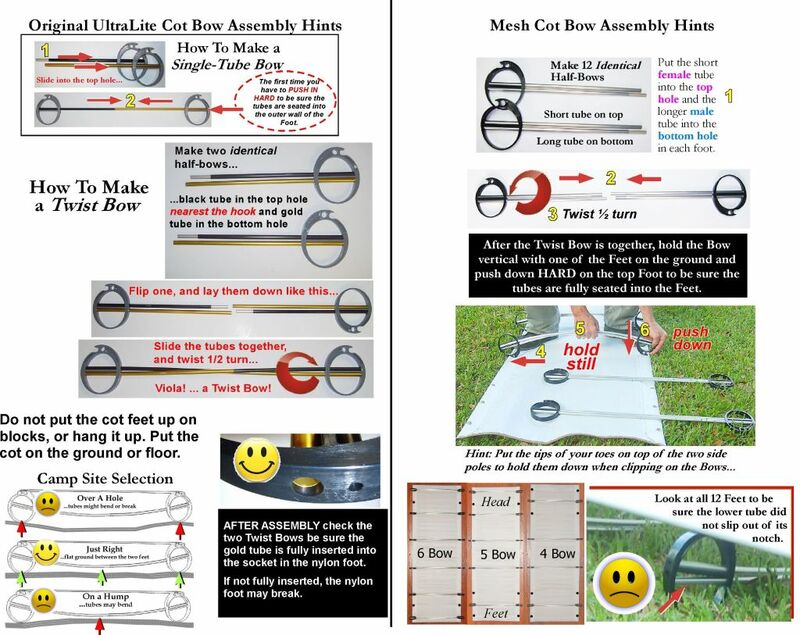 B) 5 BOW COT - Next step up is using 5 bows. At the foot end put one bow in the second hole from the end, like a 4 bow cot, but with the standard two bows at the chest end. (Always use the two twist bows in the middle two locations). That will sleep 300lb just fine. So you can lose/break an entire bow and still sleep great. Built-in spare parts!! 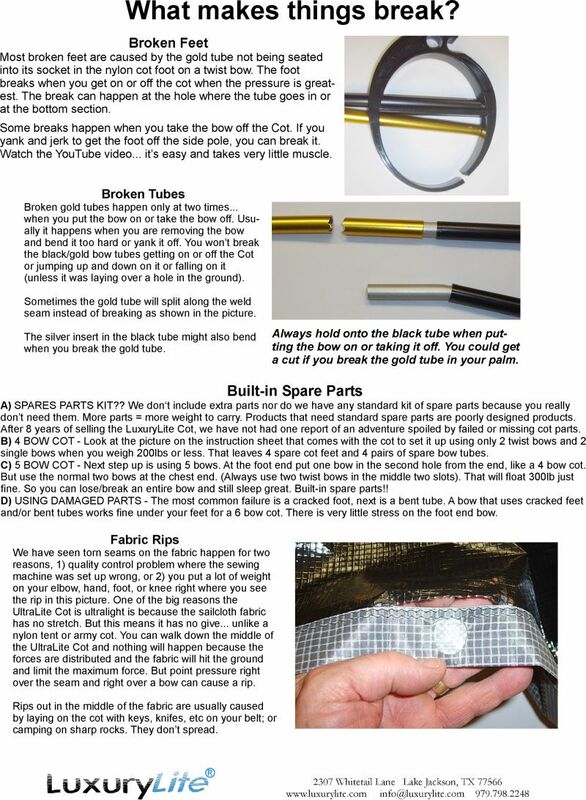 C) USING DAMAGED PARTS - The most common failure is a cracked foot, next is a bent tube. You can use a bow with cracked feet and/or bent tubes under your feet. There is very little stress on the foot end bow. $18.12 - BlackFeet Set - 4 Black Nylon Feet fit all LuxuryLite and Thermarest Cots. Made in USA. The LuxuryLite cot uses 12 feet. $47.22 - One 72-3/4 in SidePole for LuxuryLite and Thermarest Cots. Bungee-corded 5 segment aluminum. Black color. Made with Easton 7075-T9 anodized aluminum. Made in the USA. $49.95 - One 78" SidePole for 77" long LuxuryLite Cots. Bungee-corded 5 segment. Black color. Made with Easton 7075-T9 anodized aluminum. Made in the USA. $49.55 - Complete Bow Tube Set for all 24" Wide LuxuryLite Cots. 8 Male and 8 Female tubes. Silver color. Made with Easton 7075-T9 anodized aluminum. Made in the USA. $49.55 - Complete Bow Tube Set for all 26" Wide LuxuryLite Cots. 8 Male and 8 Female tubes. Silver color. Made with Easton 7075-T9 anodized aluminum. Made in the USA. Contains 4 Fiberglass Rods that can be used as Bow Rods between the Legs, Float Rods at the bottom of the Legs, or supports for the Lounge Chair back. Also includes four tubular Legs.